LG G4 review | Android review | What Hi-Fi? The LG G4 is the successor to the G3, one of the most powerful smartphones of 2014. With a host of tweaks and improvements, the G4 is a formidable device. Whether you’re after a great screen for movies on the go, or plenty of storage for your hi-res music, this multimedia beast has you covered. LG is finally getting on board with premium materials. Yes, this smartphone uses leather. We’re not talking about plastic imitation leather, either, like that on the Samsung Galaxy Note 4: this is genuine, vegetable-tanned, full-grain leather. The tan version (pictured) may not be to everyone’s taste, but the LG G4 will also come with red or black leather in the UK. The tan and red leather is fine and smooth, while the black version has a more obvious grain. Holding the device is a pleasant experience, not unlike handling a fancy wallet. It sits more nicely in the hand than a monolithic slab of glass and metal. Not a fan of leather? The G4 also comes in ceramic (white) and brushed metallic plastic (grey or gold). The latter looks and feels convincingly metallic, although it’s not as nice as anything from Apple. You only have to look at its TVs to see that LG is a fan of curves – and that’s carried over to its phones too. The G4 has the Slim Arc design – a very mild bend that offers a more ergonomic experience, while protecting the screen when it’s placed face down. The curve is very discreet – far less conspicuous than that on the LG G Flex 2 – and most people won’t notice it. Instead, all eyes will be on that leathery back. It’s not just a pretty back – it’s practical too. It can be removed to access the battery and memory card. This is a real treat for power users, and LG is now the only manufacturer of flagship smartphones to let you change the battery and storage. The 3000mAh battery is a good one – not class-leading like the Sony Xperia Z3, but a solid performer nonetheless. Under normal use, you’ll get a full day out of it. By that we mean occasional use of emails, maps, camera and movies; that got us 15 hours before blackout. Our standard battery rundown test (looping a 720p video at 50 per cent brightness, with wi-fi connected) lasted 10 hours. The built-in battery-saver mode is pretty effective at conserving power, so activate that when you hit 20 per cent and you should have no problems lasting to a charging point. Or you can take LG up on its offer and swap out the battery. Much easier. Arguably more important than the removable battery is the expandable storage. As usual LG has supplied a microSD card slot, compatible with cards up to 2TB. That's a lot of content. You’d want to use that space, because the LG G4 does a great job with content. The G4 meets the G3’s bar of a 5.5in screen, with a Quad HD (2560x1440) resolution – and goes further. Now there is an IPS Quantum Display, which promises 25 per cent greater brightness, 20 per cent wider colour gamut, and 50 per cent better contrast than before. LG says it is the closest smartphone screen to the Digital Cinema Initiative’s DCI-P3 colour space. In English: better colour accuracy, in theory. In reality, it is a very impressive picture performance. Those extra pixels really count, making a perfectly good 1080p display look somewhat soft in comparison. Images and words, moving or otherwise, are crisply rendered and wonderfully clear. Contrast is excellent. Whites are brilliant and darks are deep. It’s not quite up to OLED levels of black depth but it’s convincing enough, and a pleasant surprise on an LCD panel. Colours are good too. Skin tones look natural, while brighter hues really pop. It’s a dynamic, exciting picture. The LG’s biggest threat here is the Samsung Galaxy S6, whose AMOLED screen offers greater contrast and wallops your eyeballs a little harder. The LG, meanwhile, is more nuanced in shading and gradation. It’s a shame the LG doesn’t let you tinker with colour modes, but nonetheless this is one of the best screens we’ve seen on a smartphone. Watch some Full HD (or even 2K) footage and you’ll never look at your iPhone in the same way again. The LG G2 of 2013 was the first smartphone to let you play high-res music, and we’re pleased to see this feature has returned. Not that LG has made a song and dance about it, mind – you’ll only notice it when you load a high-res track and a ‘hi-fi’ logo pops up next to it like a sign of approval. Music performance is good. There was a time when LG smartphones sounded lifeless and dull; no more. What you get now has a fine amount of attack to tunes, and the rhythmic precision to match. Elsewhere, you’re rewarded with plenty of detail. Instruments have all the texture they need, along with clear and solid leading edges. Tonal balance is good – no part of the frequency unjustly demands your attention. It’s not to the Sony Xperia Z3’s level of snap and bite, perhaps, nor is it up there with the Samsung Galaxy S6 or the Apple iPhone 6 in terms of bite and dynamism, but overall this is a sound we’d happily listen to. An astonishing camera completes the multimedia trifecta. The snapper has had a big overhaul, and is a great step up from the G3’s already-great one. What you get is a 16-megapixel sensor with an f/1.8 lens. This takes in more light (and brighter night-time photos) than rivals such as the Samsung Galaxy S6 and its f/1.9 lens. LG also claims the world’s first colour spectrum sensor on smartphones. This is designed for better colour recognition and reproduction. The super-fast laser focusing has remained, but the optical image stabilisation has been improved. OIS 2.0 promises 2x greater stability, across three axes. New and most exciting here is a full manual shooting mode, which will appeal to anyone frustrated with the LG G3’s simplified camera controls. Now you can adjust white balance, focus, exposure, ISO and shutter. You can even play with shutter speeds, in case you want to paint light trails. The only thing missing here is aperture controls – understandable given that smartphones use fixed-aperture lenses. The G4 will carry on impressing the photographers out there with the ability to simultaneously save JPEG and RAW file formats. For the uninitiated, RAW pictures carry far more picture data, which gives you more flexibility if you want to take things to the next level and edit images on your computer. It’s a laundry list of killer camera features. This is arguably the best camera we’ve seen on a smartphone. And versatility aside, the pictures are great too. The LG G4 can yield some great results: clear, sharp images with good contrast and accurate colour balance. And it launches in as little as 0.6 seconds. There’s no point in having a killer multimedia player in your pocket if it runs like a dog. Pop the hood and you’ll find 3GB of RAM as well as a hexa-core Snapdragon 808 processor. On paper, this is not Qualcomm’s fastest processor – that’s the Snapdragon 810. Why settle for second best? Because the 810 had reports of overheating and instability issues. The LG G Flex 2 had an 810, and it was frustratingly unpredictable. Thankfully, there are no such issues with the LG G4 and its Snapdragon 808. It’s quick as lightning and smooth as butter. It had no problems multitasking with some intensive apps, playing music while downloading files and navigating by GPS. Even the split-screen ‘Dual Window’ mode ran without a hitch. Admittedly we didn’t run any numbers, but in real-life use the G4 was as fast and stable as we could ask. Out of the box, the LG G4 runs Android 5.1 Lollipop. That’s the latest and greatest of Android’s mobile operating system. 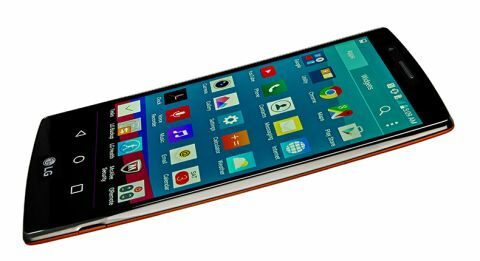 As is tradition with LG, there is a software skin on top – the LG UX 4.0 interface. It’s colourful and minimalist, very close to Google’s own Material Design aesthetics. It also works much like Google Now, which learns from your habits and changes the information you see to suit. Your photos can now be sorted into albums based on time and location. The interface changes colour based on your choice of wallpaper background. There is a smarter calendar, with more personalised notifications. A QuickShot feature even lets you take photos by double-tapping the volume-down button on the back – without activating the screen. This means fewer moments missed due to having to fumble with controls and lock screens. All in all, a slicker experience. We admire the LG G4 for daring to do something different. That leather back may not be to everyone’s taste, but it’s a refreshing change that makes the phone stand out. The audio quality may not be up there with the class leaders, but this is more than compensated for by the brilliant camera and the ability to tinker with batteries and memory cards. Overall, this is a device which fills us with glee.